Staff were dismissed for staging "a fake photograph to support a false claim (widely reported in international media outlets) that they were 'forced to sleep on the floor' of the Malaga crew room," authorities said. Six cabin crew took a picture of themselves simulating having to sleep on airport floor in Spain. 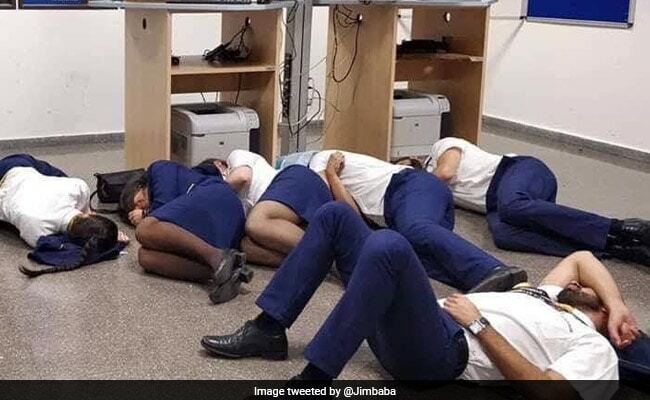 Ryanair said on Wednesday it had fired six cabin crew who took a photograph of themselves simulating having to sleep on the floor in Spain's Malaga airport as part of a protest over conditions. The low-cost carrier said the staff were dismissed for staging "a fake photograph to support a false claim (widely reported in international media outlets) that they were 'forced to sleep on the floor' of the Malaga crew room." Unions said that on October 14, as storms raged in southern Spain and Portugal, more than 20 cabin crew had to spend the night at Malaga airport. Luciana Passo, head of Portugal's SNPVAC union, acknowledged it was a protest photo. "There were 24 cabin crew members in a room with eight chairs," she said according to local news agency Lusa.